Teacher Casey Brennan gets kids out of their desks and into the dirt at Our Table's farm. Our Table Cooperative's farm is just a three mile drive from Hopkins Elementary School. But for first- and second-grade teacher Casey Brennan's students, it may as well have been a world away. "They do not even know that vegetables and fruit come from the dirt," Brennan said about the disconnect. "It's that basic, because they think that food comes from the grocery store." Brennan saw how excited Hopkins students were when the school put in 20 raised garden beds, funded through grant money, four years ago. And last school year, she organized a school-wide composting program that resulted in rich, fertile soil for this year's plants. So she decided to take the next step last year by applying for a Community Enhancement Project grant through the city of Sherwood. 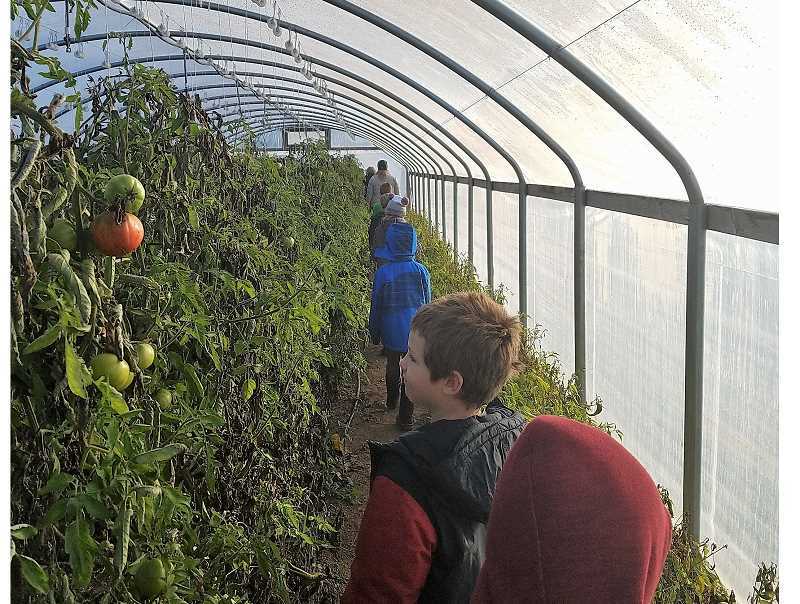 That grant has made it possible for each class at Hopkins to take three field trips to the Our Table farm — once in fall, once in winter and once in spring. Brennan said that she's been unsuccessful in securing funds from the Sherwood School District for any kind of nutritional or agricultural education, so she took matters into her own hands to make sure her students would have more opportunities. "Normally field trips, they're really expensive, and Hopkins is a Title I school," she said, referring to a federal government program that identifies schools serving low-income families. In addition to organizing the field trips with Our Table, Brennan also creates Common Core-aligned lesson plans for each class to study before their trips. The chance to get into the dirt, plant seeds and chase chickens around the farm is the payoff for in-classroom lessons about soil and sustainability. "When you go to the farm with our kids, they see where food comes from," she said. "I would say in my class (Brennan teaches second grade this year) — for the majority of students, when you pull a piece of broccoli from a broccoli plant, or when you pull a carrot from the dirt, it's just mind-blowing." During their winter field trips, Hopkins students planted radishes, lettuce, kale and sweet peas. For their spring field trips this month, the students will get to bring home a piece of their harvest, and taste a dish prepared by Our Table's chef using their produce. "All of the students will get to taste what is being grown, and then share that experience with their families," said Ann Christler, Our Table's educational coordinator. Christler organizes field trips with other schools in the area, but she said that the "farm study" program with Hopkins is currently one of a kind. She said that no matter how many books students read or videos they watch about agriculture, there's no substitute for visiting the farm. "I think most of the Hopkins kids are pretty suburban kids, so they would miss out on just physically being on the farm — the fresh air, the scope of a farm, she said. "So much about learning is the actual doing of the thing." And after each field trip, Brennan incorporates farm experiences into her lesson plans to keep students interested, and finds that "they're just able to relate new information that much better, because they have this actual background knowledge." Brennan said she'd like to become the designated agricultural teacher for the district, though there isn't currently funding for such a position. She also hopes to expand the farm study program to every school in the district, if she can find the grant money for it. "The kids are naturally excited about it and interested in it," she said. "It's really weird to see them out in the garden or out in the farm, and they are more excited than they've been all year." Road Tripping? Keep it Safe, if Not Sane! What should I know about life with braces?